$40,000 worth of sporting equipment covering disciplines basketball, football, cricket, tennis, athletics, and volleyball, was donated to the Ministry of Sports by Dr Denis Antoine, Grenada’s former Ambassador to China and Honourary Consul to Grenada in Macau. The donation took place on Wednesday, 27 March 2019 at the Kirani James Athletic Stadium and was attended by Norland Cox, Minister for Youth Development, Sports, Culture, and the Arts, Kerlon Peters Assistant Coordinator of Sports and coaches within the Ministry of Sports. The Grenada Leadership and Learning Academy (GLLA) played a very instrumental role in this process through their engagement with Dr Antoine. The GLLA, a non-profit organisation, promotes educational, social, cultural and economic development in Grenada, through programmes, projects, and activities focused to improve the quality of life of the nation’s youth and young adults. 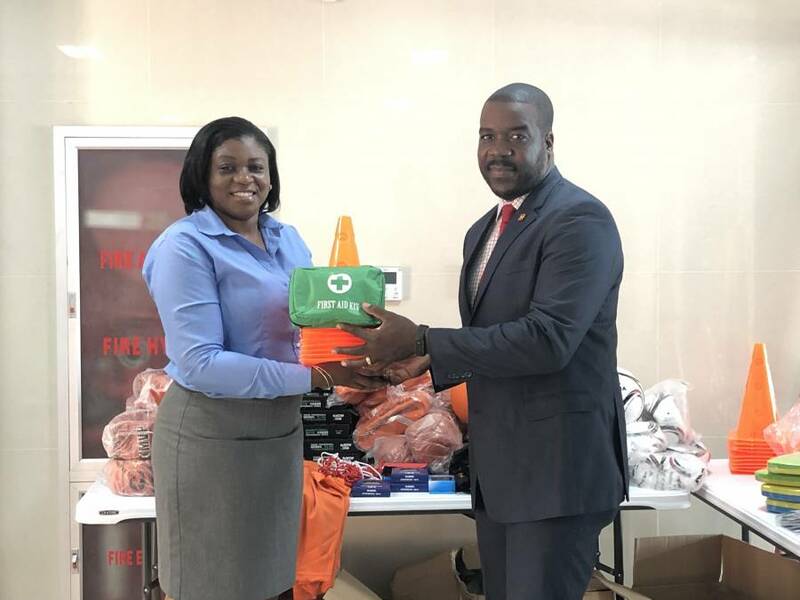 Dr Antoine was unable to attend the handover, but he was able to convey his delight to be a part of this initiative of giving back to Grenada, through his representative Akarda Ventour. “Last January, members of the Grenada Leadership and Learning Academy made contact with the Embassy of Grenada in China informing us about communication with one of Grenada’s listed Honourary Counsels in Asia. Today I am pleased to acknowledge the generous and timely in-kind donation made by the honourary counsel that will benefit the Ministry of Sport, its facilities and sporting activities in Grenada,” Dr Antoine said. Ventour handed over to Minister Cox equipment including tennis rackets and balls, ply tables, batting pads, gloves, cricket bats, kickboards, stopwatches, basketballs, volleyballs, footballs and more. Minister Cox reaffirmed his promise to boost all sporting events, stating that this sporting equipment will go a long way in boosting the nation’s athletes in all sporting disciplines. “We have immense talent in Grenada with regard to sports, but for those talents to be truly realised we need the supporting gear and hence the reason why this initiative is so important,” said Minister Cox. Peters echoed similar sentiments in thanking Dr Antoine for the timely donation and promised that the equipment would be put to good use.